This study describes the application of microwave-assisted extraction (MAE) as an innovative technique for isolation of polyphenols from tomato peel waste. Effects of solvents, temperatures (25, 55 and 90 °C) and times (5 and 10 min) were evaluated with regard to total phenols (TP), total flavonoids (TF) and phenolic compound contents. Tomato peel extracts contain high amounts of kaemferol-3-O-rutinoside (8.5 to 142.5 mg kg-1), p-coumaric acid (3 to 111.5 mg kg-1) and chlorogenic acid derivative (10.5 to 109 mg kg-1). Results revealed that extraction time has no significant (p > 0.05) influence on TP, TF and phenolic compounds recovery (exception is cis-p-coumaric acid hexoside). On the other hand, the influence of temperature and chosen solvent on polyphenols yield is significant. 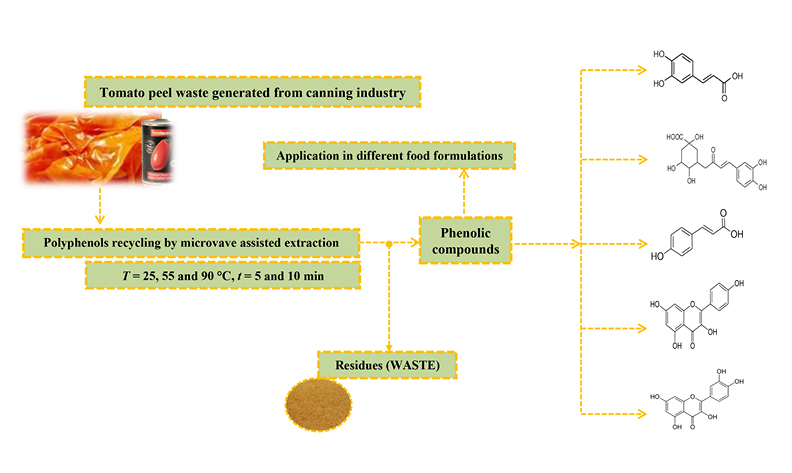 Considering interest of consumers to intake natural compounds exhibiting antioxidant properties, this work suggests that tomato peel waste can be used as one of sustainable resources for polyphenols production by MAE.